Kidbrooke Village is to lose it's two circuitous bus routes later this year when they are re-routed through Kidbrooke Park Road. Thanks to Darryl for pointing me in the direction of this TfL consultation which proposes scrapping the 178 and B16 routes through Tudway Road, Moorehead Way and Weigall Road and running them through Kidbrooke Park Road instead. 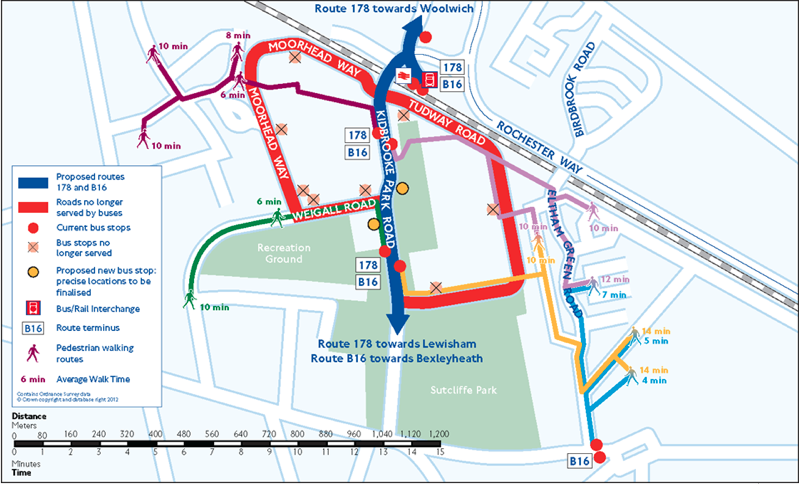 The changes will mean walks of up to 14 minutes for some Kidbrooke residents with two schools in the area no longer being served directly by the routes. The remaining shops in Telemann Square, and even Berkeley Home's own sales centre will also be cut off by the changes. "As part of the Masterplan for Kidbrooke Village a new road layout will be introduced. It has been designed so that buses would run directly along Kidbrooke Park Road, with improved walking links from bus stops to other parts of the Village." But until that time, we'll just have to wander through a building site instead. You can take part in TfL's consultation over here.